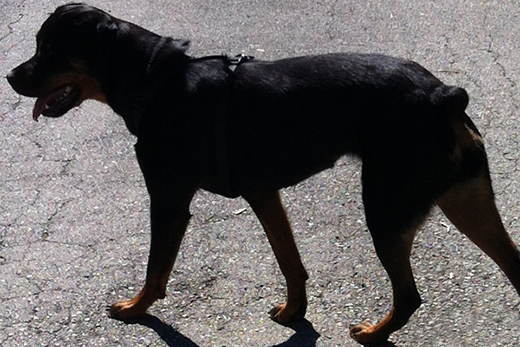 The Threat Of The Bulge Is Always Lurking | Dawg Business: It's Your Dog's Health! One big danger with obesity is that it is a gradual change. Your dog is adding on the fat slowly and you have time to adjust to what you're seeing. You know the case of the frog in boiling water, right? 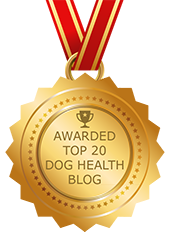 That's why objective measures of your dog's body condition are so important. Or at least the eyes of somebody who gets to see your dog only once in a while. There are situations when you need to watch out more than usually. When you get a new dog. 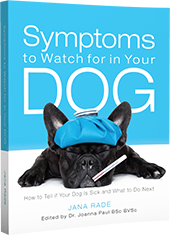 Or when your dog's health status, diet or lifestyle changes. You can do the math. But you also need to see how your dog's body is responding to it. We got Cookie two months ago. For her, EVERYTHING has changed. Her diet, her lifestyle ... I thought I was feeding her just right. And she looked just as tiny and skinny as always. But when we took her for her vaccination, the vet scored her at 3.5! That means slightly overweight. He also said she had "all the fat padding she needed for the winter" and that her waistline was gradually fading. The tricky thing about Cookie is that her frame is quite angular. More than with any other dogs we've had, the rule of thumb that when she looks too skinny she's just right particularly applies with Cookie. Fortunately for Cookie, I take this very seriously. That very day I sat down to figure out how to best lower her calorie intake (because she already gets all the exercise we can give her). In our situation it turned out relatively easy. We use home-made beef jerky for treats. So I replaced a good portion of that with slow-cooked beef instead. Little messier but it has higher water content and thus less calories for the same volume. I couldn't cut down on treat volume, because of all the training we're doing. Next thing I adjusted was the kong filling mixture. I make what I call a home-made bone meal, which is made of slow cooked chicken necks/backs/wings, or pork feet or button bones. Cooked long enough, the bones become tender and break up easily. I then run it through a grinder to create a paste. So it's not really a bone meal per se, because it contains the meat and other tissue also, but I have to call it something. It makes awesome kong filling. To cut down on the calories, I started adding vegetables. So now the mixture is about half the bone meal and half vegetables. I do need to provide the kong in order to keep Cookie occupied and out of trouble when not training, exercising or sleeping. That was all it took. Three weeks later, Cookie is at her ideal weight/body condition again. Now I still have to make sure I didn't cut back too much. I have to fine tune what exactly works best for Cookie. But fortunately, tweaking the calories in our house isn't very difficult, without asking for mutiny. The important thing is to catch it early and get right on top of it. It is so important. This is particularly true for young dogs, because the chubbier they get in their youth, the harder it will be to keep them in shape when they get older. Is your dog in perfect shape? 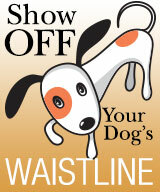 Show off you dog's waistline! 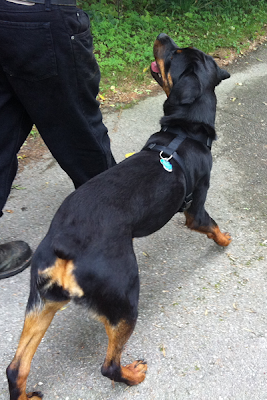 Take a photo of your dog's waistline (and dig up some old "before" photos for comparison, if you have any! ), and share your story about how you're keeping them fit. If you have a blog, blog it, if not, email me and get your story featured on Dawg Business. Great post and good reminder about your Blog Hop - I will share this and remind everyone. Thanks for the reminder to keep our dogs waistlines in the for front of our minds. Rodrigo is in great shape; Sydney is in near perfect shape and I'm proud of her. You should be proud of your work too. Are you going to participate in the Show Off Your Dog's Waistline?